Can I check to see if I am compliant with minimum and maximum labour hours? If you use reports within Bizimply you can generate a report that, will show you if you have any breaches of minimum or maximum working hours for your employees. N.B. To export this report you must set employees min and max work hours per week within their payroll information. 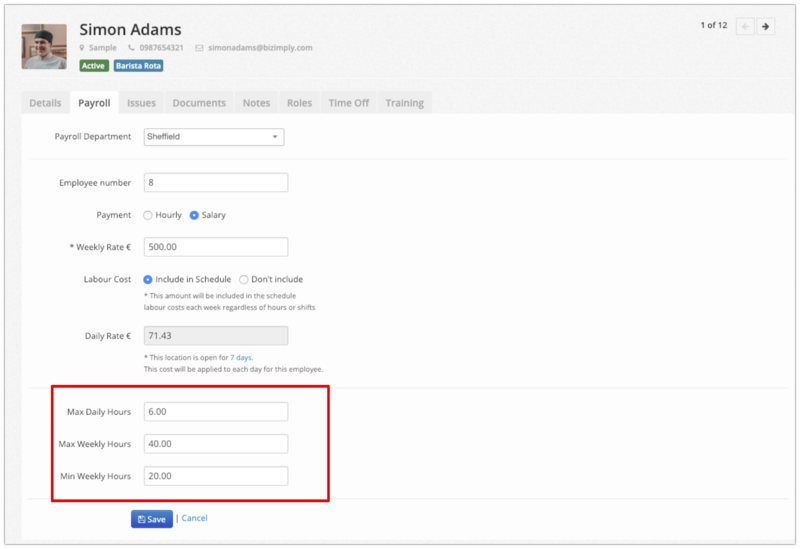 You can also quick edit employees payroll so, you can group the same contracted employees together and add their min and max work hours. What information with this new report show? Your report layout will look like the following screenshot. What do these headings mean? Rule Breached - This is one of the three values within the employee profile that can be breached which are Max Daily Hours, Max Weekly Hours and Min Weekly Hours. Rule Value - The value to which you have set within the employee profile to be notified of in case the hours entered were not reached. Hours Worked - The value here is based on the timecards belonging to the employee. It is not based on the schedule.